This article explains the ‘demagnetisation’ issue that challenges sensorless brushless DC drives that depend on Zero Crossing (ZC) detection to synchronise the next commutation phase. Above is a scope capture the ‘A’ terminals of a Multistar 4220-650Kv with 1045SF propeller running at about 50% throttle on 3S (about 4000rpm). The motor is quite lightly loaded for the purpose of illustration. The motor drive is low side complementary PWM modulated, and drive is advanced by 15° and the FETs are all N-FETs. We will focus on the detail starting at about 5 divisions on the time axis (2500µs). The explanation will detail behaviour of the ‘A’ section of the drive, but the same thing happens on the B and C sections which follow each 120° electrical later respectively. Above is a capture of the A terminal focussing on the end of one of six commutation phases. The A terminal is the ‘low side’ terminal on the left hand side (and C is the high) and the ‘sense terminal’ on the right hand side (C is the high and B is the low). At the left are ordinary cycles of low side modulated PWM (DutyCycle about 55%). When the low side FET turns OFF, the magnetic field of the coil collapses driving currents through the high and low side terminals. We will concentrate on the current driven through low side terminal. During the interval identified by the red arrows, coil discharge or demagnetisation current flows through the A high side FET’s body diode. Note that during this time, the terminal voltage is greater than the battery voltage by an amount equal to the body diode voltage drop. 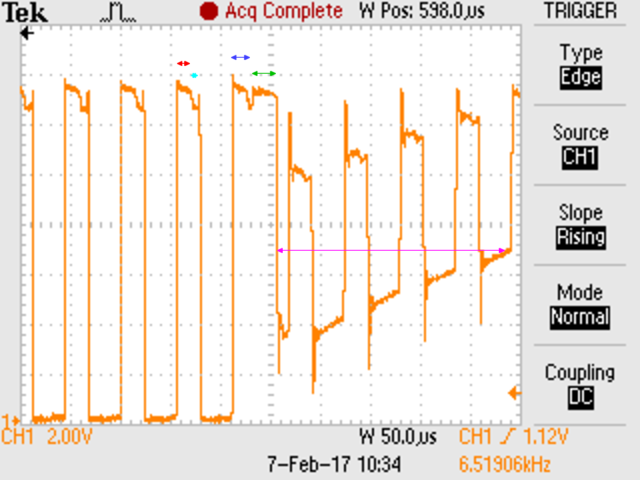 After a short time allowed for the A low side FET to fully switch OFF, the high side FET is switched on and passes current in third quadrant mode (cyan interval). The FET’s voltage drop is lower than the body diode, and again the terminal voltage is greater than the battery voltage, this time by an amount equal to the voltage drop of the FET. Degmagnetisation current flows after each PWM ON cycle, and the coil partially discharges its stored energy. The demagnetisation during this ‘power’ commutation phase is not a problem. The interval indicated by the blue arrows shows the same demagnetisation current flowing firstly through the A high side FET body diode then the FET when it is turned on. The commutation phase ends and both high side and A low side FETs are turned OFF. Demagnetisation current continues to flow during the green arrowed interval, now via the A high side FET body diode. When the coil has discharged, the voltage on that wire is influence by the PWM modulation of the active coils. During the PWM ON period, the voltage is the sum of approximately half battery voltage plus the voltage induced in the sense coil by virtue of relative rotation of the magnetic field. A comparator in the ESC compares voltage of A with the average of A, B and C, and the comparator provides a commutation time reference for the middle of a commutation phase. This is commonly known as Zero Crossing (ZC) detection as it detects when coil A’s induced voltage passes through zero. 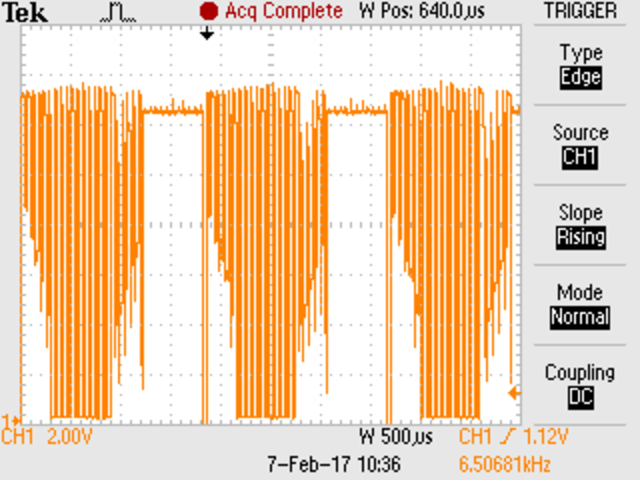 This is a sampling process that can only occur during PWM ON intervals, which means that some ZC will be detected a little late. It is critical to motors that use each ZC to synchronise the next commutation pair that the sense wire is available for position sense some reasonable time before the ZC instant, meaning that any demagnetisation current MUST have ceased. 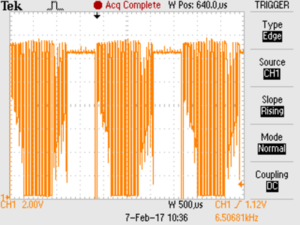 In Fig 2, the sense wire becomes available for that purpose about 220µs before the instant of ZC, the magenta interval, which is quite comfortable under the operating conditions captured. The demagnetisation time depends on a number of parameters, including the winding inductance, the motor power, the winding resistance and external resistances. as rpm increases, the commutation phase time decreases (ie the time available for demagnetisation decreases). There is also a period of demagnetisation current flow in the other sense phase in drive section A, it occurs at 3.6div from the left in Fig 1. The case is somewhat similar to the one detailed but current flows though the low side FET body diode only and there is no complementary PWM complication. The duration is usually not longer than the high side case discussed earlier. There are of course the same two demagnetisation intervals in the other drive sections B and C.
In the case of the motor discussed, on 4S with a 1245SF propeller, demagnetisation time due to higher current and shorter available time will cause loss of sync at less than 100% throttle, and even with a 1045SF propeller on 3S, it cannot withstand rapid acceleration without sync loss. Some ESCs contain strategies for attempting to recover from sync loss, those strategies may not be totally effective. Recovery strategies usually depend on reducing power by one or other means to try to minimise interference with the sense signal. 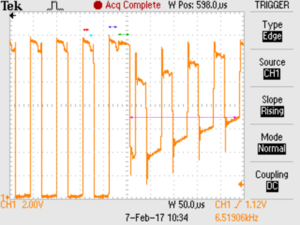 Limiting motor current may assist in avoiding sync loss. A common technique for trying to avoid such sync loss is to advance commutation timing which advances the end of the commutation phase allowing more time for demagnetisation. This is a circumvention rather than cure and it degrades drive efficiency and battery endurance.